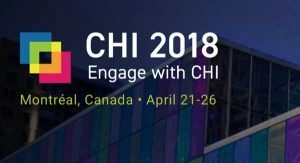 Through our ongoing collaboration with Harvard University in the field of immersive technologies and participatory urban planning, we will be organising a Special Interest Group at ACM CHI Conference on Human Factors in Computing Systems, the premier international conference of Human-Computer Interaction, in Montreal, Canada in April 2018. The team leading the Special Interest Group consists of Nektarios Christodoulou (Famagusta Ecocity), Andreas Papallas (Cyprus Interaction Lab), Zona Kostic (Harvard University) and Lennart Nacke (Waterloo University) and it is titled: “Information Visualisation, Gamification and Immersive Technologies in Participatory Planning”. We encourage everyone interested in the subject and attending CHI this year to join us as we look forward to an engaging and lively session. Public participation in the decision-making processes that shape the urban environments we inhabit is an imperative aspect of a democratic society. Recent developments in the fields of Information Visualization, Gamification and Immersive Technologies (AR/VR/MR) offer novel opportunities for civic engagement in the planning process that remain largely unexplored. This SIG aims to identify ways in which these technologies can be used to tackle the public participation challenges identified by the European Commission, the UN Habitat and the World Bank and experienced by citizens across the world. The overarching goal of this SIG is to define methods and processes where technology can facilitate public participation in the planning process for the inclusive and democratic development of our cities. The overarching goal of this SIG is to bring together an interdisciplinary group of practitioners, academics and policy makers from the CHI communities (Design, User Experience, HCI for Development (HCI4D), Sustainability and Games & Entertainment) and beyond, to discuss innovative ways to increase the transparency, accountability and democratic legitimacy of this innately political process.